You are currently browsing the tag archive for the ‘Friz Freleng’ tag. 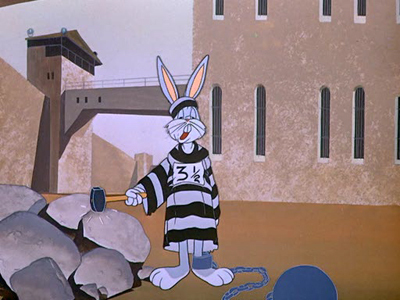 To escape some hunters, Bugs Bunny hides inside a prison, where Sam Schultz (Yosemite Sam) is a prison guard. What follows is a great series of prison gags, including two morbid ones resulting in Sam hanging on the gallows and being electrified in an electric chair. Throughout the cartoon the warden keeps calling for Schultz, not unlike the Nazi officer in the Ernst Lubitsch feature ‘To Be Or Not To Be’ (1942). ‘Big House Bunny’ is full of excellent gags and Freleng’s timing is superb throughout, making ‘Big House Bunny’ one of those little known masterpieces. To the next Bugs Bunny cartoon: What’s Up, Doc? ‘Daffy Duck’s Easter Egg-Citement’ is an Easter-themed Looney Tunes television special produced by DePatie-Freleng. Unlike Chuck Jones in ‘Bugs Bunny in King Arthur’s Court‘ Friz Freleng doesn’t attempt to tell one long story in the 25 minutes he’s got. Instead, we have three: the first evolves around Miss Prissy, who, in Foghorn Leghorn’s egg farm, lays a golden egg. Daffy and Sylvester find it, and fight eachother for it. This episode contains the only fine piece of animation of the whole special: the depiction of a paranoid Daffy in a car. 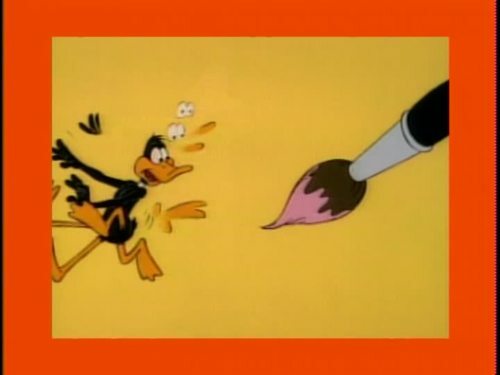 In the second episode Daffy is a guard at a chocolate bunny factory, protecting it against Speedy Gonzales, and in the third Daffy tries to go south, trying several options, including a horse. This part reuses the horse from the Pink Panther cartoon ‘Pinto Pink’ (1967) and some of its gags, too. These stories are framed with Daffy in a very ‘Duck Amuck‘-like setting. Like ‘Bugs Bunny in King Arthur’s Court’ ‘Daffy Duck’s Easter Egg-citement’ suffers from bad designs (especially Foghorn Leghorn, who’s not a Freleng character, is badly drawn), can music, slow timing and excessive dialogue. ‘Heir-Conditioned’ was the second of three propaganda cartoons funded by the Alfred P. Sloan Foundation (the other two being ‘By Word of Mouse‘ from the previous year, and ‘Yankee Dood It‘ from the next year). 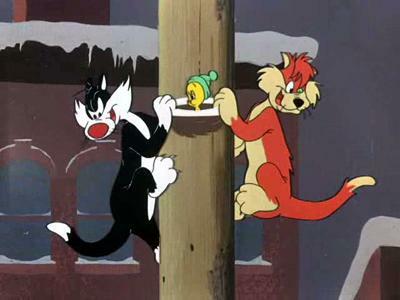 In this cartoon Sylvester has inherited a fortune, and all the alley cats try to persuade him to spend it. 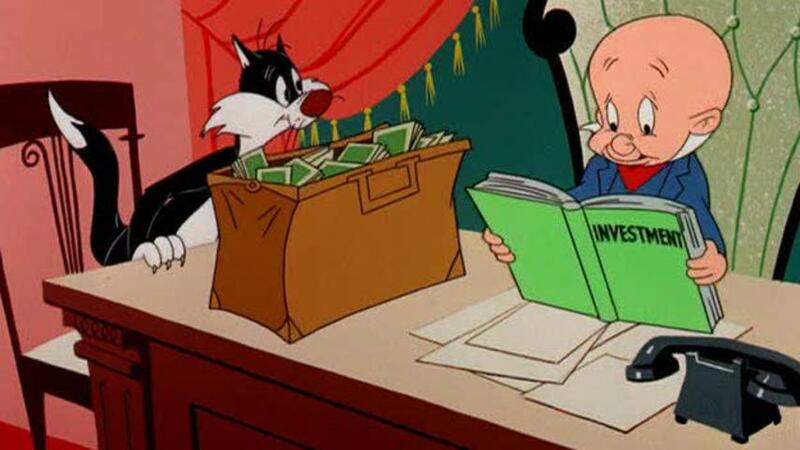 But Elmer, who’s Sylvester’s financial adviser, persuades Sylvester, and all the listening cats, to invest the money, in a lecture celebrating the capitalistic system, now focusing on the importance of investment. Sylvester remains pretty much the straight man in this cartoon, with most of the comic relief coming from the alley cats. In the mid-fifties Friz Freleng directed three propaganda shorts celebrating the American capitalistic system. They were funded by the right wing Alfred P. Sloan Foundation and curiously, they all feature Sylvester the cat. ‘By Word of Mouse’ is the first of the three. In this cartoon we’re taken to the rather backward German town of “Knöckwurst-on-der-Rye”. Here mouse Hans tells his siblings about his trip to America. Cut to his memories: we watch him meeting his cousin Willie at the harbor. Willie takes the astounded Hans to a trip, showing the riches of the Americans. Because Hans doesn’t understand how this can be, Willie takes him to a university mouse, who lectures the two about mass production and mass consumption. Comic relief is provided by Sylvester, who chases the three mice, interrupting the lectures. But he cannot hide the fact that, although being an ordinary Looney Tune, ‘By Word of Mouse’ is pretty informative, if rather propagandistic by single-mindedly glorifying the wonders of capitalism. ‘By Word of Mouse’ was followed by ‘Heir-Conditioned‘ (1955) and ‘Yankee Dood It‘ (1956), covering similar grounds. During a chase Sylvester falls down and ceases to be. He goes straight to hell, where a bulldog-like devil tells him he can return to earth because he has still eight lives left. Unfortunately, back on earth Sylvester loses his lives fast, especially during a chase at a carnival. 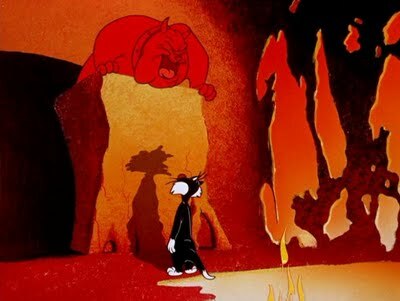 ‘Satan’s Waitin’ shows some similarities to the Tom & Jerry cartoon ‘Heavenly Puss‘ (1949), including bulldog devils and a heavenly escalator. Nevertheless, it’s one of the most original and most inspired of the Tweety and Sylvester cartoons, on par with the celebrated ‘Birds Anonymous’ from 1957. 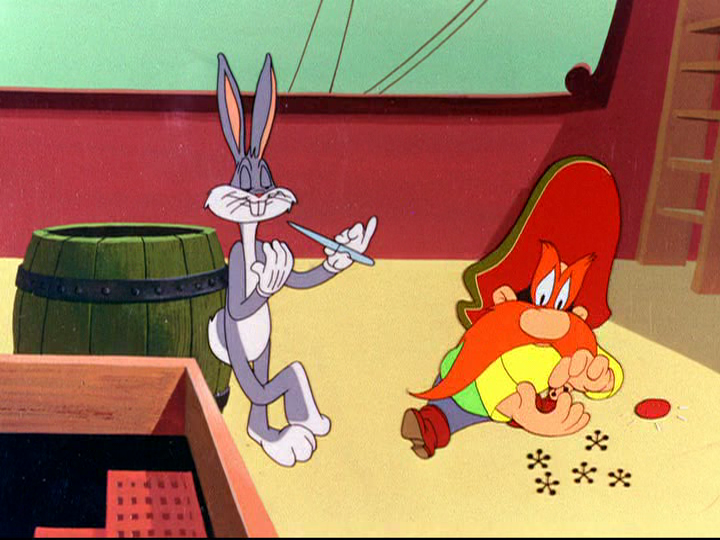 Already in his third cartoon Yosemite Sam is used outside his original Western setting, and changed into a timeless adversary of Bugs Bunny. In ‘Buccaneer Bunny’ he’s a 18th century pirate called Seagoin’ Sam. This idea of Sam as a timeless foe was a masterstroke, and in the following years, Sam would be Bugs Bunny’s nemesis in a wide variety of settings, like the American war of independence, the Sahara desert, ancient Rome and the middle ages. ‘Buccaneer Bunny’ is a wonderful start of this series, consisting of wonderful gags, including a beautifully timed multiple door gag. Bugs Bunny also does a great Charles Laughton parody, disguising as captain Bligh, as portrayed by Laughton in ‘Mutiny on the Bounty’ (1935). ‘Three Little Bops’ retells the story of the three little pigs in a jazz style. The film features voice actor Stan Freberg as a singing narrator. 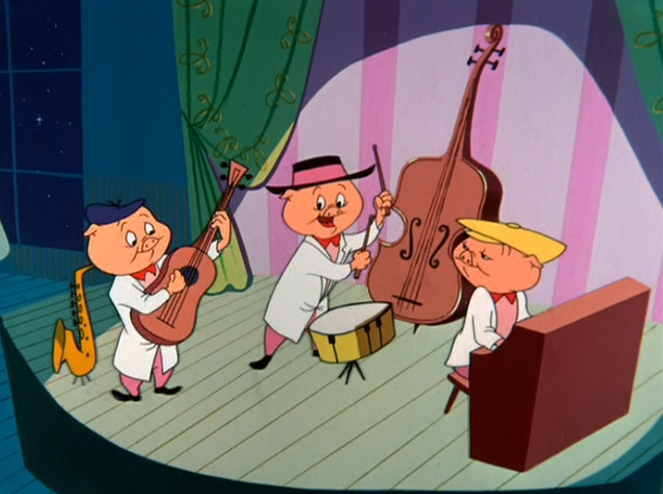 In the cartoon the three little pigs are jazz musicians who play jump blues (not bebop!). The wolf is a corny jazz cat, who wants to sit in, but whose trumpet playing is too amateurish to entertain. Only in hell the wolf learns that “you gotta get hot to play real cool”. 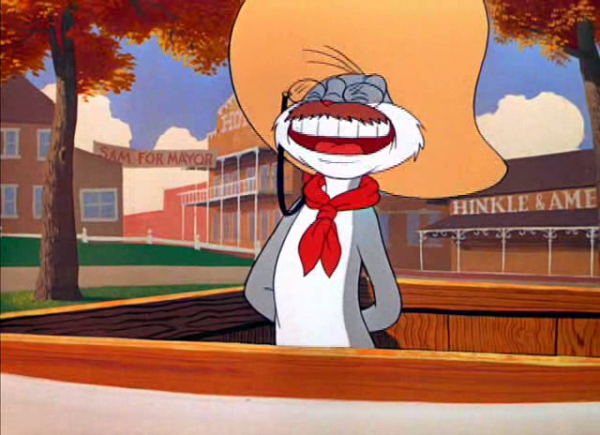 The film is unique within the Warner Bros. cartoon canon because it features neither voice work by Mel Blanc nor music by Carl Stalling/Milt Franklyn. It even lacks the ‘That’s All Folks!’ ending, showing a ‘The End’, instead. In the cartoon Stan Freberg does all the singing, while the swinging rhythm & blues music is provided by jazz musician Shorty Rogers and his combo. Together with ‘Rhapsody in Rivets‘ (1941), the cartoon is one of the best examples of director Friz Freleng’s perfect sense of musical timing. The result is one of the most entertaining animated cartoons of the late 1950s. Elmer Fudd will inherit three million dollars from Uncle Louie, if he doesn’t hurt any animal, especially rabbits. Bugs, of course, takes advantage of the situation. ‘The Wabbit Who Came to Supper’ was Friz Freleng’s second Bugs Bunny cartoon, only, but he understood the brassy character completely. The highlight of the cartoon is the scene in which in the middle of a chase a clock chimes and Bugs bursts into a convincing New Year routine… in July. 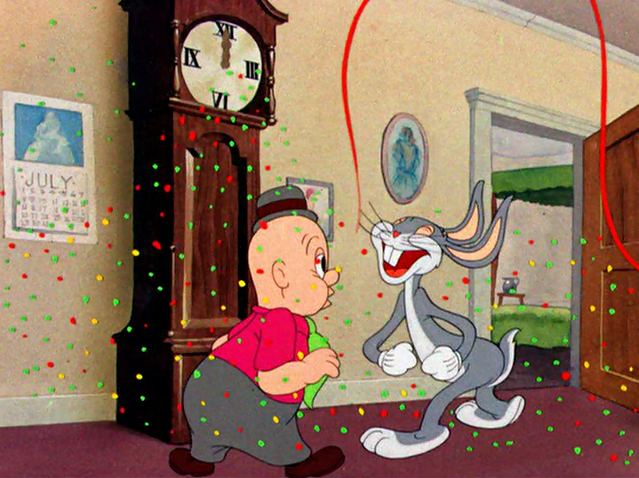 This scene not only shows the fresh character’s overpowering personality, it also shows Bugs Bunny’s ability to produce necessary attributes out of nowhere, this time confetti and streamers. Bugs’ design, however, is rather unappealing and uncertain in this cartoon. And Elmer Fudd, too, has the less appealing alternate fatty design, which Robert Clampett had introduced in ‘Wabbit Twouble‘ (1941). Luckily, this design was short-lived and lasted only four cartoons. Two years later Hanna and Barbera would use the same plot idea in the Tom and Jerry cartoon ‘Million Dollar Cat’ (1944) with even better results. When his home country looks like a desert and he becomes short of carrots, Bugs migrates to Alabama. Unfortunately, the ‘Mason Dixie Line’, the border between the North (desert) and the South (beautiful green landscape), is protected by Southerner Sam, who isn’t aware that the civil war has ended ages ago. This preposterous idea leads to great gags involving several impersonations by Bugs, a.o. of Abraham Lincoln. Sylvester is down in the dumps and hungry, foraging a harbor, when he discovers Tweety on a ship. He climbs aboard, and what follows are several gags involving glasses and sea sickness. The best gag is when Sylvester paints Tweety on Granny’s glasses. Most of the other gags, however, are mediocre, and feel routinized. 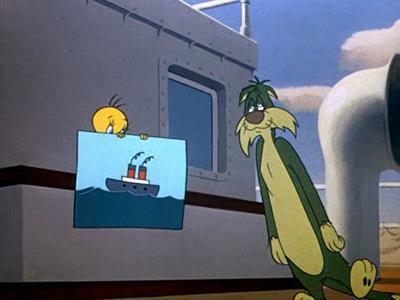 For example, Tweety reuses a sea sickness gag from Tex Avery’s ‘The Screwball Squirrel’ (1944), but much less well executed. It’s winter and Tweety is troubled by two cats (Sylvester and a red cat with a bad eye), who fight over him. Most of the comedy derives from the feud between the two, and only in the end Tweety himself comes into action, making the two cats fall into an icy pond. With ‘Putty Tat Trouble’ Freleng returns to Tweety’s first solo films, Bob Clampett’s ‘A Tale of Two Kitties’ (1942) and ‘A Gruesome Twosome‘ (1945), in which also two cats fought for the little bird. Freleng’s humor is different from Bob Clampett’s, but once again, the feud works very well. Apart from Tweety’s talking, all the comedy is silent and brilliantly executed, too. 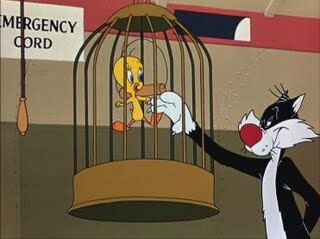 This makes ‘Putty Tat Trouble’ one of the better Tweety and Sylvester cartoons. 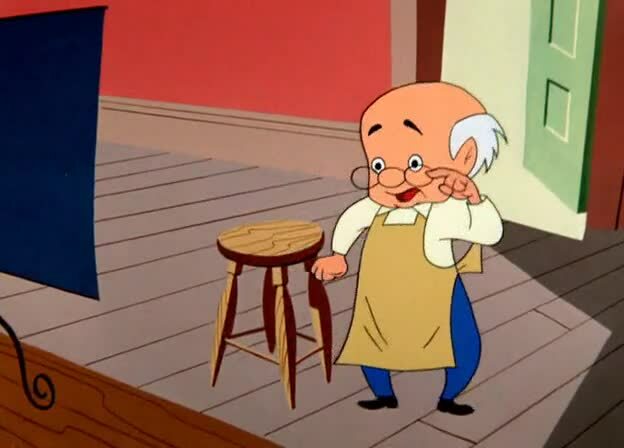 In one scene we can see a Friz Freleng portrait in the background. 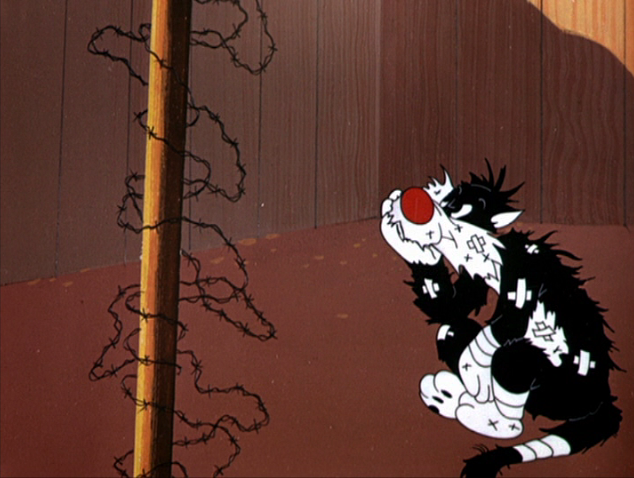 In this cartoon Sylvester is the cat of a couple, who go on a holiday to California for two weeks, leaving Sylvester behind and locked indoors. Sylvester runs into agony when he discovers this, until he finds a kitchen-cupboard full of tins of fish. Unfortunately, a mouse has the can opener. 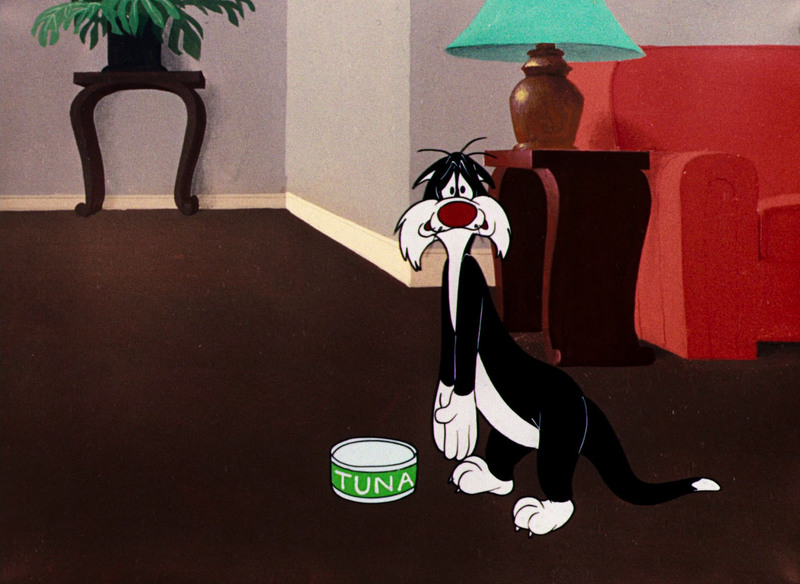 This leads to perfectly timed blackout gags, in which Sylvester makes several attempts to get the can opener. When he finally succeeds, he discovers that the particular cupboard is locked, while the mouse has the key. Due to its cat-and-mouse-routine ‘Canned Feud’ has similarities to the Tom & Jerry cartoons, although it has a distinct Friz Freleng style. Unlike Jerry, the mouse is completely blank, and its motives remain unclear, but Freleng’s comedy works nonetheless. In fact, this film is better than most contemporary Tweety and Sylvester cartoons. Sam is running for mayor. One of his election promises is “to rip the country of every last rabbit”. This prompts Bugs to fight Sam with his own weapons, running for mayor, too. ‘Ballot Box Bunny’ is an inspired and funny cartoon, even if it does not belong to either Bugs’s or Freleng’s greatest. Granny sneaks Tweety into a hotel where no pets are allowed. Another old lady sneaks Sylvester in, who inhabits the room next to Tweety. Like in ‘All a bir-r-r-d‘ Sylvester encounters a vicious bulldog, too. 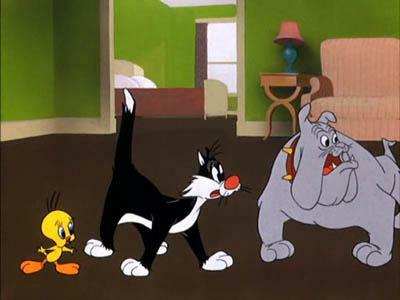 The cartoon contains a classic corridor-with-doors-gag, but the cartoon’s greatest joy is its great twist on the chase routine, provided by a pet inspector who at times interrupts the chase of the three animals. ‘Room and bird’ is the first of four 1951 Warner Brothers cartoons featuring music by Eugene Poddany instead of Carl Stalling. ‘All a Bir-r-r-d’ is Tweety and Sylvester’s fourth cartoon and in this short their chase takes place in the baggage wagon of a train. Sylvester’s pursuit is extra hindered by a train conductor and a vicious bulldog. ‘All Abir-r-rd’ is a rather formulaic chase cartoon, and in no way among Tweety & Sylvester’s best. It is noteworthy however, for introducing Tweety’s theme song, sung, off course, by Tweety himself. ‘Canary Row’ has absolutely nothing to do with John Steinbeck’s novel ‘Cannery Row’. Instead, it is the sixth Tweety and Sylvester cartoon, and the first to feature Granny as Tweety’s owner. 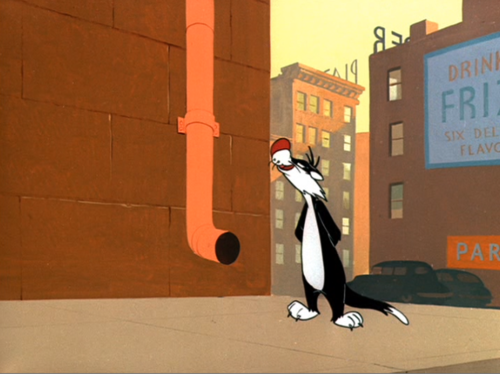 In this short Sylvester tries to capture Tweety, who lives in on a top floor in a hotel in which no cats are allowed. But Tweety and his owner Granny give Sylvester a hard time. The takes on Sylvester are superb: he’s well animated and his gags are excellently timed, showing Freleng’s craftsmanship. However, Tweety and Granny are hardly as funny, and their appearances wear the comedy down. If not necessarily for its comedy,’Canary Row’ is noteworthy for its beautiful urban backgrounds, painted by Paul Julian, who would soon join UPA to elevate his background art to even greater heights. 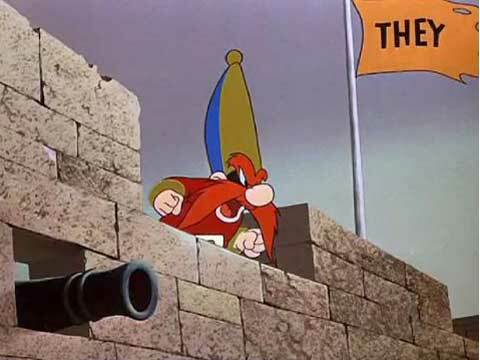 In ‘Bunker Hill Bunny’ Bugs Bunny and Yosemite Sam (as Sam von Schamm, the Hessian) enact the war of independence of 1776 with only the two of them, stuck in two fortresses. With this simple premise Friz Freleng shows how one can make great comedy out of a very limited setting. 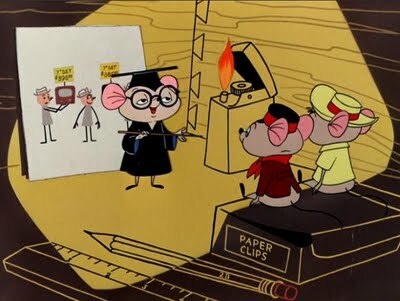 The result is a cartoon full of excellent blackout gags, which are simply hilarious because of Friz Freleng’s superb comic timing. Again and again Sam hits the dust. It even contains a gag in which Bugs has no part in Sam’s self-destruction at all! 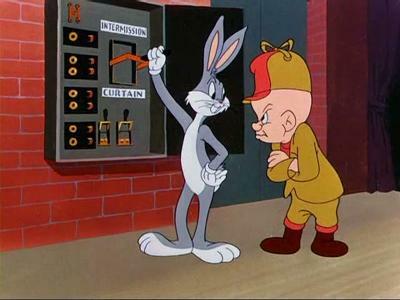 This Bugs Bunny short starts with Elmer Fudd hunting our hero with a “wabbit detector”. Like Freleng’s quite similar ‘Stage Door Cartoon‘ (1944), the action soon shifts into a theater, with wonderful comedy with Bugs’s and Elmer’s repeatedly passing past sitting people, continuously using the phrases ‘pardon me’ and ‘excuse me’ as a major highlight. 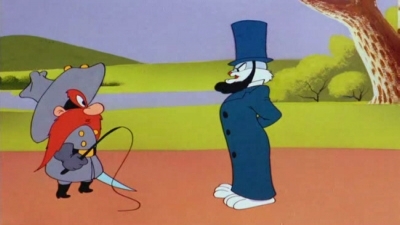 Other great gags are Bugs’s playing with the intermission switch (which immediately causes the public to rush outside to smoke) and the finale, in which Bugs manages to get a blinded Elmer into a lion’s beak. Despite the wonderful comedy, the film nevertheless fails to reach the heights of ‘Stage Door Cartoon’, falling short, due to some bad designs of Elmer and to a sense of routine.